Want to know more about the Vivint wireless camera ADC - V520IR? Are you also searching for the best indoor wireless IP cameras? If it's a yes to both questions, then let's dive in! In recent times, there has been a growing need to monitor activities both indoors and outdoors in the home, office, or school anywhere in the world. This has brought about the popularity of Wi-Fi security cameras and made various brands to compete In designing the best that can meet the user's expectations in 2018. With each equipped with high-end specs, it becomes difficult to make a decision on the right IP camera system for your home. 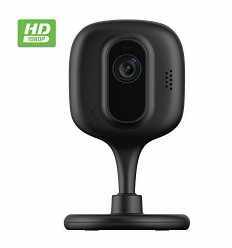 For starters, it would be a camera provides good image resolution, night vision, auto motion and sound detector, two way sound system and most importantly, a reasonable price tag. A wireless IP camera is a security system that monitors and keeps track of the events in your home or office. It can be an indoor surveillance system or one that is made to be used in the outdoors, but in either case, they send you alerts when motion or loud noises are detected. Moreover, you can stream videos captured by these cameras and stored on cloud storage directly from your smartphone, Tablet, or Computer. These video footage can be accessed irrespective of where you are thereby keeping you updated with the recent happenings as if you were there. If in your absence, you could still track your child's routine, watch your nanny care for your baby, check up occasionally on your old grandma, and even spy on a lover. Your kids can play indoors while you tend the garden or work in the garage while you can still monitor their activities, talk to them from outside and even get responses from them. The capabilities of these cameras such as night vision and automatic motion-activated recording will have peace of mind since you're less worried about the turn of events in your home. This and many more are the benefits of a hidden wireless IP Camera which has made them a necessity in some homes. Let’s jump right into the Aalrm.com wireless camera model ADC V520IR review. 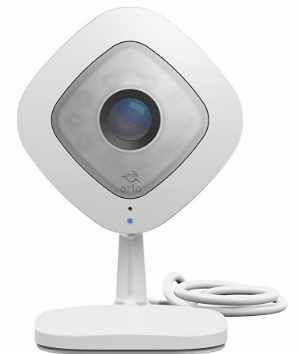 The Alarm.com indoor wireless fixed IP Camera (ADC-V520IR) is also known as the LW-IP-CAMIR (LiveWatch Home Monitoring Service). It may not be the most pricey out there, but it is a professional surveillance solution to keeping your home safe and the people within it. This camera system is from a smart home services provider in the United States and Canada, Vivint, Inc. The ADC-V520IR comes with an infrared night vision technology that can capture even in the dark at a distance of about 20 feet. Its ability to record videos at a High definition resolution of 720P, allows it to deliver images with a decent quality that can be likened to those captured during the day. It has an adjustable compression option ranging from high, medium, and low to allow for live viewing and controlling the video quality during recording. Whether you're at work, school, or on a vacation, you can monitor your home by accessing these videos from any web-enabled smartphone, computer, web browser, or application. Due to the competitive nature of the market, you'll find several indoor surveillance cameras from different brands sporting remarkable features. But in all, some are better than others and that is why we have taken the time to choose the best Indoor Wireless IP cameras in 2018 that can be used as alternatives to the alarm.com wireless camera ADC-v520ir. 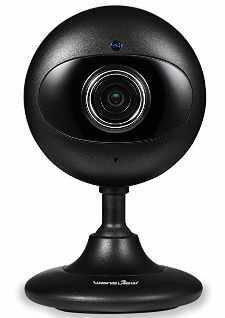 An indoor IP camera with audio that can capture images in high resolution, offer large cloud storage space, and is easy to connect and use, is the Netgear Arlo Q. This is a 1080p HD Security Camera (VMC3040) that has 8x digital zoom and enables you to see images in details even in the dark thanks to its night vision technology. There is a 2-way audio with an inbuilt mic and speaker on this camera. For voice control, it can also work with Amazon Alexa as well as other third-party apps. According to Netgear, its 130-degree field of view covers every angle in your home which allows you to see and hear all that is happening within it. With the sound and motion detection feature, the Arlo Q camera sends you instant alerts. Users of this system can get 7 days of free cloud storage where your videos are temporarily stored. As its downside, there is no microSD card slot on this camera and what this means is that you have to save your videos online and stream them using the Arlo app. Motion Detection Range: Adjustable up to 50 feet. The Wansview Wireless HD Camera with night vision technology comes highly recommended by buyers on Amazon. This WiFi IP Security Surveillance camera can be installed on a desktop, wall, ceiling or placed on a table to monitor a baby, pet, nanny, or an elderly person during the day and at night. Coupled with its night vision are 4 IR LEDs that light up an entire room at night and enable videos to be captured in clear details even from a long distance. The 120-degree viewing angle of this camera allows the entire room to be captured even without panning or tilting the camera and its multi-view allows you to switch between several cameras at a time. Using the Wansview app, you get to see images captured in an HD resolution of 720P and hear sounds quickly. Although there is no microSD card slot on this mini Home camera to enable you to save your videos, videos captured can be streamed online from your Android phone or iPhone, iPad, Window PC, and web browsers such as (IE, Firefox, Safari, Chrome supported). 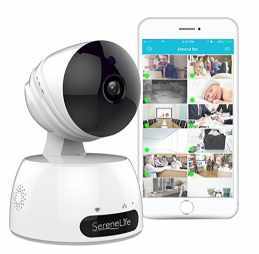 Serenlife is an Indoor Wireless IP Camera with remote app control for Android & iOS. This camera has a video capturing resolution of 720p, high enough to ensure that the images you see are of a decent quality. With its remote app control that allows for PTZ (pan, tilt, and digital zoom), as well as the camera's motion and sound detection and night vision, your Home, Office or Business can be under full surveillance 24/7. 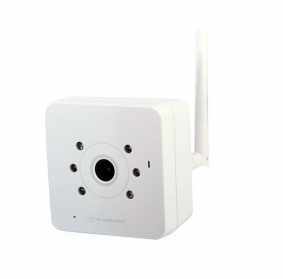 This is a wireless IP camera that can be set up via P2P technology, allowing for ease of installation, connection, and usage. Also worthy of note, is that this camera comes with a micro SD card slot to enable you to save recorded videos in an external storage device (Up to 64GB). You can also choose to take advantage of its cloud box storage support (Up to 2TB of video storage) that will enable you to stream your saved videos anywhere and from a web-enabled device. The real-time app alerts for sound & motion detection and the built-in microphone & speaker for a 2-way audio communication all make this IP camera system one of the best buys. One more wireless IP camera system you should put into consideration is the Zencam 1920 x 1080P WiFi Camera. At that resolution, you can view your videos in high quality with little or no loss in quality when it has been zoomed. Like the aforelisted Indoor Security Wireless IP Cameras, it also comes with a two-way audio communication that will allow you to speak and be heard, and also receive responses. There's the night vision technology to look forward to, as this camera can keep you at alert and scare potential burglars away from your home. When it comes to its storage capabilities, you can either make do of its MicroSD card slot for your memory card (Up to 64GB) or back up your recorded footage to Zencam's cloud storage. The wide viewing angle of 115° of this camera will ensure that a large area is covered at a time. The Zencam security app that will enable you to monitor the turn of events can be installed on an iOS or Android device, as well as a Computer running on the Windows Operating System. 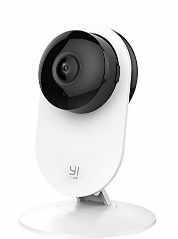 As one of the bestselling surveillance video recorders on Amazon, you need to check out the YI 1080p home camera. It has a wide-angle lens of 112° and an aperture of f/2.0 in a bid to provide full coverage of a room. Its HD resolution also means that you can expect your videos to be full of color, and with a zoom up to 4x, you'll be able to make out even the tiniest details. Using the YI Home app for iOS or Android phones/PC/Mac, you can access up to 4 live camera feeds on one screen and with its integrated gyroscope support, you can pan your smartphone left and right. The app also provides a user interface for you to customize settings such as Activity alerts, camera sharing, and schedules to meet your preferences. Since storage is of the essence, videos that have been captured can be stored on the YI Cloud where no storage limit has been set. You get a one-month free trial to store your videos. You can also settle for a memory card since there is an expandable card slot on this IP camera. This camera has a night vision technology which does not have an LED or infrared glare that may be disturbing. After hours of research and reading verified buyers reviews and recommendations on Amazon to know the problems most users faced with their current Camera System and areas where they are expecting improvements, we were able to narrow down to only 5 cameras. A camera with a wide viewing angle not less than 100 degrees was our target selection. The implication is that it will be able to provide full coverage without having to tilt the camera. Most of our selected Wireless cameras have a viewing angle of at least 112° with only the SereneLife indoor wireless IP camera featuring a 90° whose other features makes up for this downside. The ability to back up your videos to either an online cloud storage or local storage such as a microSD card is essential. This is because you may need an evidence later and as such, our chosen camera systems either have an expandable memory slot or offers cloud storage. You'll also find some like the Serenlife wireless camera, YI Home camera, and the Zencam offering both methods of storage. To see images in tiny details and ones whose quality is not significantly affected when zoomed in, a camera that records in at least 720p is recommended. Wireless cameras we've selected have either a video recording capability of either 720p or 1080p. Other than being able to see pictures in clarity on your Camera's app, it is also important to have a camera with a built-in microphone and speaker. This way, you can speak and be heard, and also receive audible responses from your listener. This can help to scare away an intruder or caution your kids against playing with certain objects. For this reason, all the cameras selected have a two way sound system. Whether it is in the day or nighttime, it can be helpful to know that your indoor IP security surveillance system can still pick up sound and movement to the best accuracy. In line with that, our selected cameras have a night vision technology that will not only help to capture in low light but provide some light for you to move around in lowly lit areas. While the Vivint wireless camera ADC-v520ir is a good buy, there are several other alternatives that you can take advantage of. And most remarkably, you can find them at a lesser price with admirable features as well. Now take the next step and buy one of these indoor surveillance cameras that will not only ensure that your home is protected at all times but give you the peace of mind that the people within it are as safe as possible.